Geographic Maps on Dunhuang City and Area of far West Gansu Province. 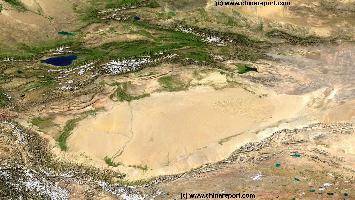 A Satellite Image Map of the Entire Gobi Desert Region and the realtive position of the City Datong in it. Map overviews North-West Xianjiang Autonomous Region, Mongolia, Inner Mongolia and North and North-Eastern China giving a Full Overview of the Gobi Deserts. 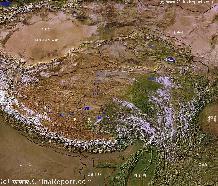 Clearly visible details of geographical features such as mountain ranges, rivers, valleys and lakes, national borders, name and location details of Cities and Villages (clearly visible). 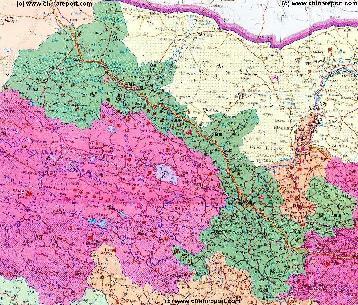 The Dunhuang Report Maps Index gives acces to all Maps relevant to Dunhuang and wider Area of the Hexi Corridor in far Western Gansu Province, as used and/or produced by ChinaReport.com. Please use these Maps to find your way more easily around the City and Area's many Monuments and Landmarks. Follow the links to more information, photos and backgrounds on each location. A Geographic overview Map of Gansu Province entire delineating provincial borders and parts of neighboring Xinjiang-Uygur Autonomous Region Province and Qinghai Province in the West, Inner Mongolia AR and Ningxia Province in the North, Shaanxi Province to the East and Sichuan Province in the South. Includes Cities and Towns (shown by size), Main Monuments & Landmarks of Gansu Province, the flow of the yellow river through Sichuan, Qinghai, Gansu and Ningxia Provinces, BingLing Si, Maji Shan and Mogao Caves UNESCO World Heritage Sites, Main Mountains (with Height), major highways, provincial railroads and main railroad-stations, and main waterways & rivers. This Map further provides links to on site photos and information on the Cities and Main Monuments Other sites will be included in the Future. A Schematic overview Map of Gansu Province entire delineating provincial borders and Main Landscape Features in Gansu and parts of neighboring Xinjiang AR and Qinghai Province in the West, Inner Mongolia AR and Ningxia Province in the North, Shaanxi Province to the East and Sichuan Province in the South. Includes Cities and Towns (shown by size), Main Monuments & Landmarks of Gansu Province, the flow of the Yellow River along the borders through Sichuan, Qinghai, Gansu and Ningxia Provinces, BingLing Si, Mogao Caves and Maji Shan UNESCO World Heritage Sites, Deserts, Mountains (with Height), major highways, provincial railroads and main railroad-stations, and waterways & rivers. This Map further provides links to on site photos and information on the Cities and Monuments. A Satellite image Based Map of China and East-Asia, with a super-imposed schematic Map of the Location and Path of the Great Wall as constructed during the Reign of the Ming Dynasty. 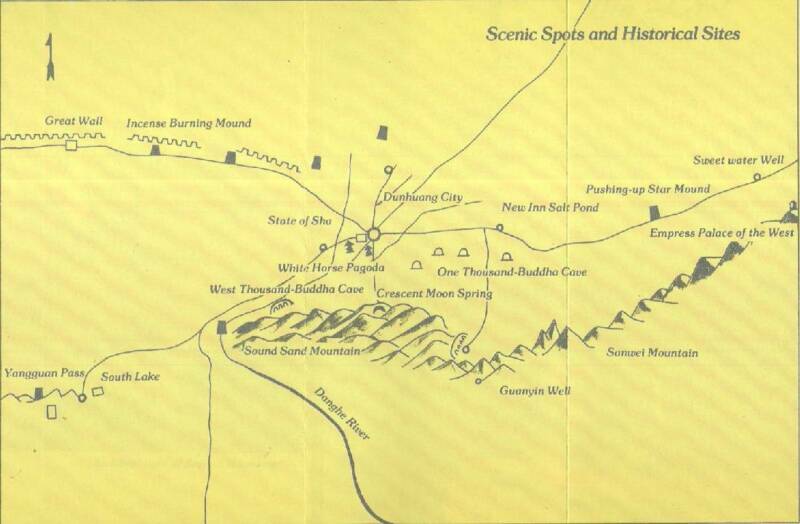 Included for reference are Locations and Names of Passes on the Great Wall of China and their significance. Further Reports link to More Photos and History & Backgrounds of each Great Wall of China Site. Further depicted are City names, geographical features of landscape, rivers and more. Schematic Overview Map of the City of Dunhuang and surrounding Area's in far western Gansu Province. A 1950's Era Map that depicts the Main Sights, Landmarks and Monuments of the immediate area of Dunhuang as well as the location of Dunhuang's City Center, the new modernized Railway Station of Dunhuang and the nearby Dunhuang City Airport. Subjects of interest are Sighing Sands Mountain, Crescent Moon Pool, the White Horse Dagoba, White Horse Temple, Han & Tang Dynasty Great Wall of China, the Jade Gate (YuMen), YangGuan Pass, Mogao Caves and Sanwei Mountain. Google's Best efforts at information regarding remote and small Dunhuang and Oasis, the home of the Han Dynasty Great Wall of China remnants in China, The Yu Men or Jade Gate and YangGuan or Sun Gate Pass, the two military and civil control points and access gates to the North- and South- Routes of the ancient Silk Road in China. Use the Google Map, the Satellite Image options and all other available features to find your information, judge the rugged terrain of Dunhuang, Jiayuguan and the Hexi Corrdior and/or even find adresses and streets in the Village. Google Adds more detail over Time. With Patience this Map will help you along better ! Contribute ? - Upload your Photos, Videos and Information and link it to the Google Map for anyone in the World to appreciate ! Try It sometime, during or after your Travels !